Let's face it. Teaching is hard work! I know, I know, we all got into this profession for the money (am I right?) Ha! All kidding aside, it is a daunting job and that many people balk at. "Oooh, you teach? Oh, right... Those you can't... Teach." I've heard that saying more than I'd like to admit. In fact, if I had a nickel for ever time I heard it... Well, I'd probably own an island by now! But, the fact is, teachers run the world! I wouldn't be writing this, and you probably wouldn't be reading this if it weren't for teachers. So, why do we get the short end of the stick here? Sometimes, going far too long without the credit and recognition that we deserve. This lack of acknowledgement, encouragement and understanding leads to serious burnout. If you are a teacher, you know it can be rough. And if you teach special ed, you know it can be especially tough business. You want the best for everyone. You obviously got into this profession because you are passionate about what you do and you want to make a difference. Principals and districts want higher test scores and increased time on task and parents can be demanding at times. Burnout sometimes seems inevitable. So what can you do? How can you please everyone at every time? 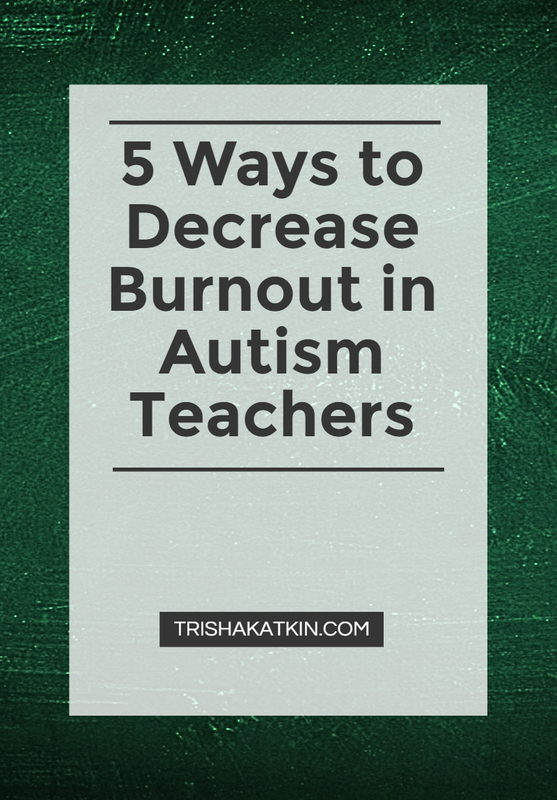 Here's my top 5 ways to decrease burnout as an autism teacher. 1. Don't Take Work Home! This is a big one. Work is work and home is home. Keep them separate. If you don't, you may learn fast that you are not spending the quality time with those that are waiting for you at home. The ones that are the reason why YOU go to work for every day. Make sure that you set a time that is reasonable for you to leave work every day and stick to it! Don't let yourself fall into the trap of staying at work so late as to detriment the relationships you have at home. This also means don't let work follow you home. I know this is tough. How can I not wonder what happens at home for my students, or worry that they are not getting everything that they need. Now, I'm not saying that if you have a legitimate reason that you believe that this student is not being properly cared for, by all means, it is your duty to report. Let me tell you a story. I once had a colleague that came to work with black under her eyes and looking disheveled. She looked as if she hadn't slept in weeks!She was the type that always came to work dressed to a tee even though she would be chasing children down the hallway all day. I finally asked her what was up. And you know what she said? She was up all night thinking about how one of her students didn't have access to the internet at home. Seriously? That's what kept her up all night? Now, not having the internet may be a life changing crisis for some, but this is definitely not a reason to stay up all night and at the expense of your own health. Try and make sure that you keep things in perspective. If the student is not in immediate danger, being harmed physically, mentally, or sexually, you probably don't need to be staying up all night worrying about it. And if you are legitimately worried that your student is in immediate danger and you have valid reasoning to believe as such, then it is your duty to place a call and report it. But if you feel sorry that your student is not allowed to take the school iPad home for the night or that they don't have the finances to buy the coolest new sneakers, you need to get over it. These things will eat at you quickly if you allow them and it is seriously hindering your judgement in other areas. If you are spending that much time worrying about whether or not your student has access to the internet, you may be missing the more important problems right in front of your face. That being said, it's hard to not feel sorry and want to help, but if it is not a serious reportable issue, you need to let it go. Okay, we spend all day helping students. We observe the subtle signs of struggle, seamlessly intervene, and just as seamlessly, bow out of the picture. It is our job to recognize when a child needs help. But what do we do when we need help? Some of us may sit in front of our computer or mounds of paperwork and wonder how it is all going to get done. Wondering who has the time to run down to the teacher's room to make copies of IEPs or meeting notices. Is there even any paper in the copier? Who's going to go to the supply room and get more paper? Who has time for it all? Now, I'm sure you have felt this struggle. You were on your way to make a copy of this or that and probably allocated enough time to do so and BAM! One of your students is having an EPIC meltdown in the hallway during lunch. The next thing you know, you are spending the next hour trying to calm down a student, their paraprofessional, or worse their classroom teacher. Before you know it, you may be called into the principal's office because she has heard all about how your student started a food war comparable to WWIII because his mashed potatoes touched his turkey. So what's a teacher to do? You need to be there for your student, support your paraprofessional, and offer tips to the classroom teacher doing lunch duty, but you also have to get your own work done. My suggestion to you is learn how to delegate. It is vital to survival to know what you can and can not out source. I once worked in a high school where all my students were "behavior issues." I had the classroom that every teacher knew, but wouldn't step foot in. Not even the principal! Now, I had an unruly bunch, but I "tamed" them with some ingenuity. I asked the student with ADHD to go to the supply closet and bring up a case of reams of paper. I used this task as heavy work for a student that needed to expel some energy every day before English class anyway. But in a way that made him feel useful, worked his muscles, and calmed him down before English. Perfect! He could get what he needed as far as sensory input, feel useful, and have a positive interaction with teachers, who appreciated the fact that they didn't have to lug a case of paper to the copier. I asked the paraprofessional to start the copies I needed when she went down to the teacher's room for lunch. That way, by the time she was done with lunch, so were my copies. GENIUS! Learn how to delegate and how to ask for help in ways that people will actually follow through. Make sure that this is a symbiotic relationship. You can not go around ordering people to do things and expect them to do everything for you. The key here is to ensure that the people you are asking help from are also getting something in return that helps them out. The student with ADHD received a positive interaction with teachers, he felt good about himself, and was happy to help because he felt useful. The paraprofessional that made copies for me was allowed to leave 10 minutes early from her class so that she could start the copies and they not take up any of her lunch time. Make sure that the people you are asking help from do not feel used. It is a give and take. But, importantly, the first step in this is that you actually need to recognize that you need help in the first place. Set aside 5-10 minutes each day to brainstorm the daily or weekly activities that you do that can be tackled or delegated to someone else without overburdening them as well. 3. Don't Take It Personally. This is a good one because as a teacher of students on the spectrum, you probably have a hard time with the fact that some days are better than others. Some days your student may know all of their grade level sight words, and some days they may just look at you like you're nuts. It's hard to not think you are a failure when one day your student can sit through their entire music class utilizing the coping mechanisms that you have taught them, and then the next week, have a total meltdown and soon as they step into the music room. Unfortunately, you may never know what is happening to your student with autism. You may never know what they are feeling, or what is going on in their head. I once had a student that had the worst, EPIC upon EPIC meltdown I had ever seen. He could barely get off the bus and into the school without repeatedly dropping to the ground and having a full-blown tantrum. Finally, after an hour of uncontrollable sobbing, we called his mom to see if she had an insight. Then the light bulb went off. She had forgotten to say goodbye to him by placing her hand on the bus window that morning. That little gesture that she did every day, had sent this student into a total tail spin. His mother promptly came to the school to make sure to say a proper goodbye to her son, and the student finished his day off without a hitch. Had his mother not realized this blip in her behavior, who knows how long it would have been before someone had made the connection. This shows just how important it is to not take things personally. It is the nature of autism to have its waxes and wanes and it is okay to good days and bad. You may never know why the student acted a certain way one day and not the next. It could be a natural flux in the nature of autism, but it could also be something totally unbeknownst to you. Something that you may not even have insight to you as was in the case with my student. If his mother had not realized, the school would have never known why he had had such a bad morning. So, what I'm saying here is, do your best. Teach your heart out. Use best practices and evidence based models. If your student has one bad day, shake it off and tell their parents. If your student continues to decline, take note, document behaviors, and have a talk with their parents. You may need a meeting, or the student may be coming down with something. But either way, having a pity party for yourself because you think you are the cause of their decline is counterproductive. Be proactive, involve parents and figure it to together. 4. Take Care Of Yourself! Yes, please! I know, its hard. Finding time to take care of yourself is tough. You spend all day tending to the various needs of your student that you do not want to stop to take care of yourself. You may even feel bad or guilty for closing your door and trying to gain a bit of energy as you scarf down your lunch. But, this is an important step. IF YOU ARE GOING TO TAKE CARE OF OTHERS! Reread that a few times in case it hasn't stunk in. You are not an effective teacher if you are run-down, tired, or hangry. Get enough rest at night. Make sure to not take that work home, get a good night's rest and eat a balanced breakfast. Students on the spectrum may not understand your facial cues, but they can sense your anxiety. So, if you are getting grumpy because you haven't eaten all day, take a break! Take a couple of minutes and eat something with some balanced nutrition. A granola bar, peanut butter crackers, something that will tide you over until a proper meal time. That being said, don't miss your lunch! You are not helping anyone if you are walking around the school with your hangry eyes on. LOL, #hangryeyes! 5. Look For the Positive, Even If It's a Little Step! Here we go. Look for the positive! All too often we fall into the trap of wanting something so bad, that we lose sight of the little steps along the way. When I first got one of my students he was completely "feral." That's how the district's BCBA described him. "FERAL." I thought, what an interesting, yet completely inappropriate, word to describe a student, but I went with it. I observed this student run around the classroom, hoard food and toys, bite himself and scream at anyone who got close to him. He was completely non-verbal. I sat back and contemplated running away to a different profession. Maybe a nice door greeter at Wal-Mart? But seriously, at first I didn't know how I would get through to him. I mean, these other professionals that knew him for the last 2 years described him as, "feral." What could I do? But, after I realized that I was in this profession to make a difference and to help the toughest of the tough, I tackled the situation. Instead of looking at this child as, "feral," (yuck, what a terrible word to call a kid anyway,) I looked at what the child could do. He had amazing fine and gross motor skills. He could hide under desks and squeeze in between classroom dividers with ease. He could climb like nobody's business and jump from tables with amazing acrobatic skills. Now, I know that climbing on tables and hiding under desks was not ideal, but I could see that this student had potential. He wasn't running in circles and acting totally, "feral." He just didn't trust any of us. The lighting was too bright, we were new people to his schema and we just didn't fit in. Not yet, at least... I worked intensively with this kiddo. Everyday for 6 and a half hours a day. I learned his behavior and their functions, and he learned how to communicate with me. At first, all he needed to do was to make eye contact and we would go for a walk to the swing (a preferred activity). Soon, I was having him make a small sound and eye contact in order to get access to the swing. I gained his trust as he realized that I would take him to where he wanted to go as long as he complied with me. I kept my expectations low and gradually increased the demand on his part. By the end of the school year this student could verbally spell his name, say his ABCs and recite the Pledge of Allegiance among lots of other amazing things! The BCBA was astounded. She didn't know how I did it. How I could tackle so much and far surpass what her team could get out of him in 2 years. But, I'll tell you a secret. It's because I took it slow. I didn't expect academics out of him right away. I didn't ask too much. I set flexible boundaries that were shaped into the behavior that I ultimately wanted. I took a very overwhelming child that the district admitted that they couldn't handle and I figured him out. Now, I am not a miracle worker by any means, and it was tough work. But it was all the little steps that I took to get him where he is today. I found a positive each and every day. I found something in his day that was a success story. Even if it was that he only ran out of the classroom 4 times that day instead of 6, I took that as a success. I turned things around. I found the positive. If I didn't see each and every small step as a positive march towards a goal, I never would have made it. I could have easily succumbed to burnout. I could have easily ran to become a door greeter at Wal-Mart. So, if I can stress anything to you, its make sure you find the positive in what you do each and every day. It is important. Many people around me were skeptical. They never believed that this student would amount to anything. I knew better. I knew that I just needed to tap into his process. Figure out his end game and work together. So, I encourage you to find the positive. It doesn't have to make sense to anyone else, and as long as it helps you continue on your way to the main goal, then you are doing something right. Do not be frightened of the student that comes with the "bad" reputation. He or she is still a person. See past the comments and bias that may precede this student. You can do this. It takes time, but if anyone can do this, its YOU!